Blue grass seed for lawns, pastures and quality turfgrass. Including Kentucky Bluegrass seed. 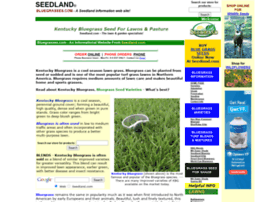 Bluegrasses.com - Sales and information on Bluegrasses, grass seeds, lawn care and maintenance. Buy online @ Seedland.com. Hosting company: Continuum Data Centers, LLC.